A barred owl caught a lucky break when a snorkeler banded with wildlife officials to rescue the bird from a fishing line tangled in trees above the James River. 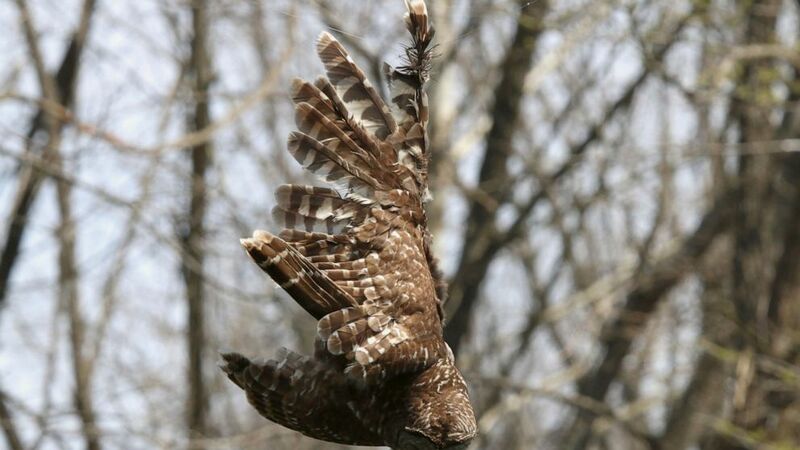 Bill Hulsebus was visiting the Springfield Conservation Nature Center last week when he came across the injured owl, dangling by its right wing more than 20 feet (6 meters) above the river. Hulsebus told the Springfield News-Leader that firefighters attempted to release the owl from the line, but their equipment couldn't reach the bird. "Out of nowhere, Jonathan Knapp shows up with a wetsuit," Hulsebus said. "The owl miraculously landed right in his hand," Huslebus said of Knapp's rescue. "The owl was upside down but kind of flapped its wings on the way down," Knapp said. "Both feet landed on one hand. I couldn't believe it!" Volunteers then took the owl to Dickerson Park Zoo's Raptor Rehabilitation Center, where the bird was given a feather transplant to repair its damaged wing. "The owl will have a few days to rest and let glue set. After that, it will go into the flight cage and be monitored to see how it is flying," said Joey Powell, a zoo spokesman. "It should be released in about a week and a half if all goes as expected."